Supply this postprocessor to an IterationAdaptiveDT via the postprocessor_dtlim parameter. The timestep limit computed by this postprocessor is computed according to two different criteria. If a nucleus has just been added to the nucleus list by the DiscreteNucleationInserter the timestep limit is set to the value supplied using the dt_max parameter for one timestep. In conjunction with IterationAdaptiveDT this causes the time step to be cut to dt_max from which it will slowly have to grow back. where is the total nucleation rate over the whole simulation cell that results in the probability . To obtain for a given equation Eq. (1) is numerically inverted. is then divided by the integrated nucleation rate per unit time to obtain the largest possible time step that keeps the probability for two or more nuclei to form below the user specified upper bound. Timestep (dt) in a nucleation simulation with a DiscreteNucleationTimeStep limited time step. 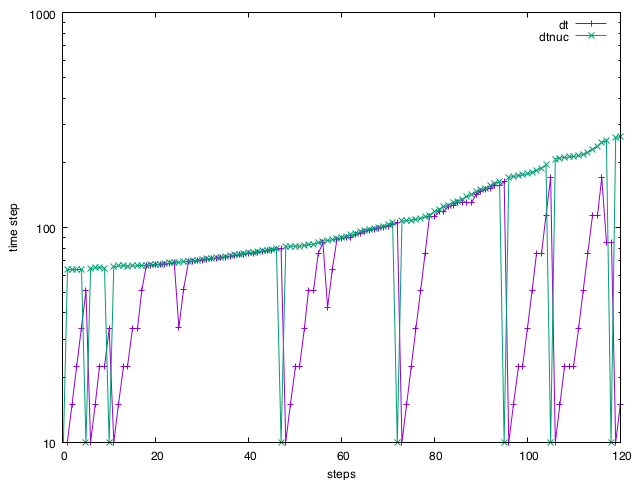 The green curve (dtnuc) shows the time step limit. The envelope of that curve is determined by the upper bound on the two or more nucleus probability. The sharp downward spikes are the time step cut-backs during nucleation events. This addresses two issues with poisson statistics sampling. At every sampling point in the domain the rate is sufficiently low to stay in the rare event regime (i.e where either zero or one event are happening). At higher rates the time resolution is insufficient to capture all possible nucleation events. Controlling the probability of multiple nuclei forming also reduces the chance of overlapping nuclei to form. The DiscreteNucleationTimeStep postprocessor is part of the Discrete Nucleation system. p2nucleus0.01Maximum probability for more than one nucleus to appear during a time step. This will limit the time step based on the total nucleation rate for the domain to make sure the probability for two or more nuclei to appear is always below the chosen number. Description:Maximum probability for more than one nucleus to appear during a time step. This will limit the time step based on the total nucleation rate for the domain to make sure the probability for two or more nuclei to appear is always below the chosen number.